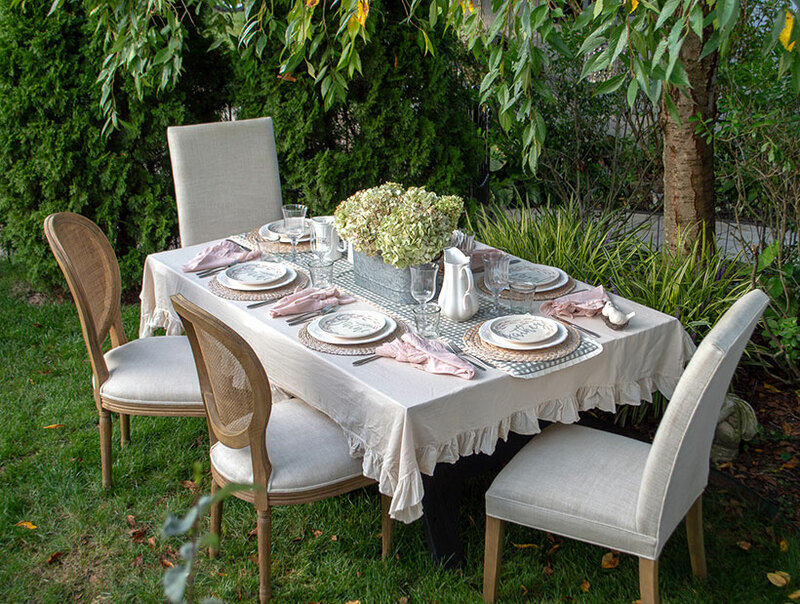 Gather together with friends and family for a lovely meal outdoors! Rustic and refined details combine for a cozy meal to be enjoyed with good company! Fall is the time for entertaining! It is when family and friends gather around the dinner table to be thankful and celebrate the harvest. Early autumn is the ideal time to plan a relaxed gathering under the stars. Forgo the typical autumn color palette and opt for the soft and neutral tones. Try these simple decorating tips to create your own inviting and romantic fall farmhouse table. Dine in the fresh air and sunshine while it lasts! Cool and crisp fall weather is perfect for outdoor fun before days get colder. There is nothing more beautiful and inspiring than nature. For that reason, I often treat of our backyard as another room in which I can entertain in. And while the temperature allows, I set most of our dinner parties. So take your delicate linens, pretty dinnerware, mason jars and flowers outside – add some candlelight for ambiance and enjoy the colorful view. 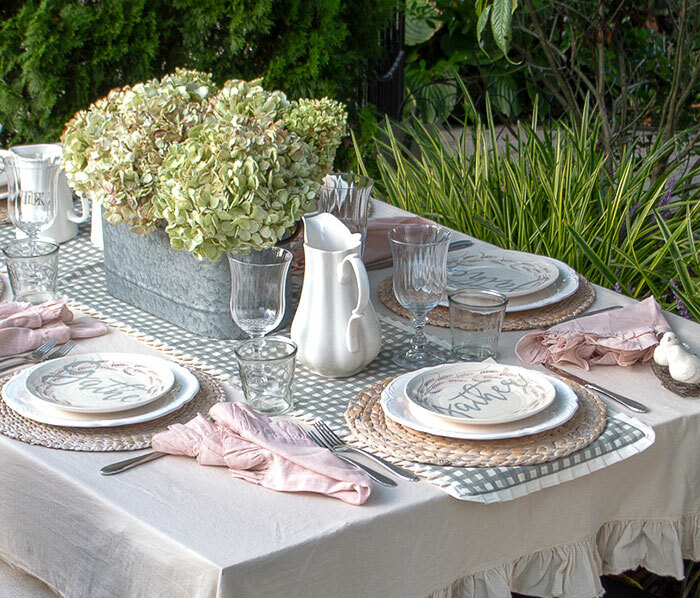 The gray and white gingham table runner sets the stage for this rustic and refined tablescape. 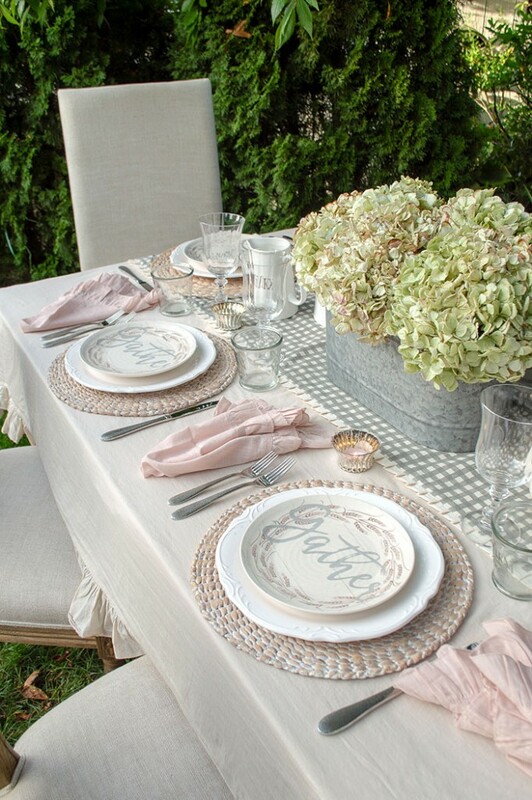 A neutral color palette always adds an element of romance to a table. It makes such a statement on its own. Choose dinner plates, glassware, linens and flowers in neutral tones to keep the tone of your table soft and understated. 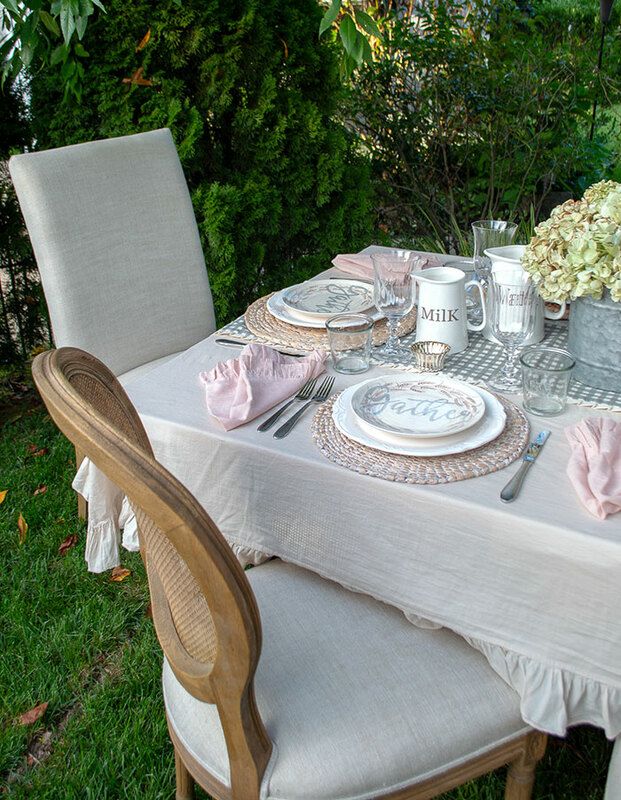 For this table, I selected a simple cream linen tablecloth. To add that bit of a farmhouse feel, I layered a gray and ivory gingham check table runner on top of the tablecloth. 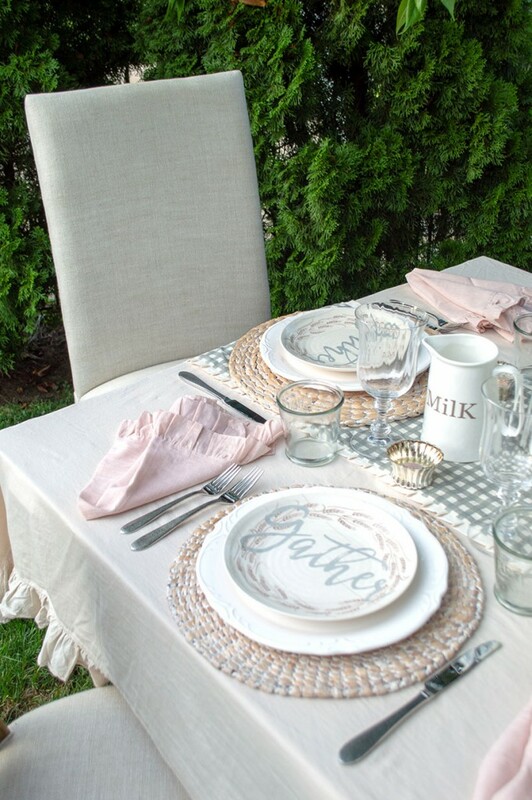 Pink ruffled napkins add a subtle touch of color and loveliness. Fall is a time for festivities with family and friends! 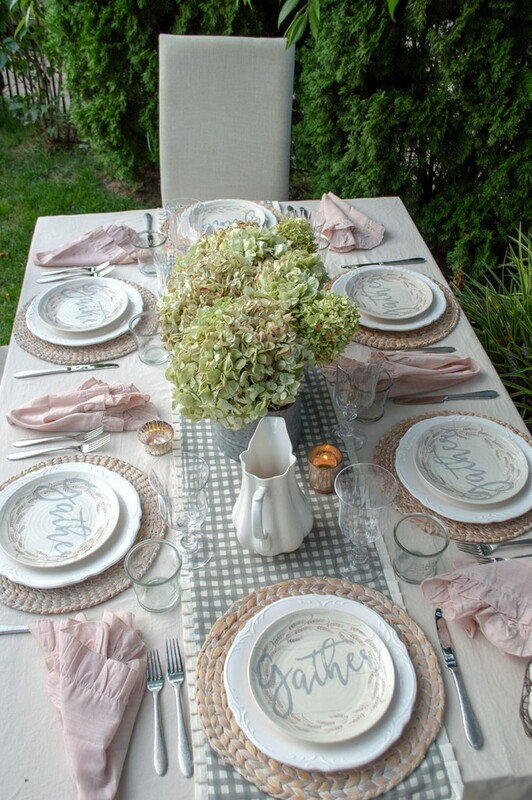 set the convivial mood by setting the table with meaningful reminders. Introduce seasonal touches to your table by simply adding accent plates, decorative pieces and flowers that reflect the seasons transformation. Just be sure to select objects that are neutral in color. 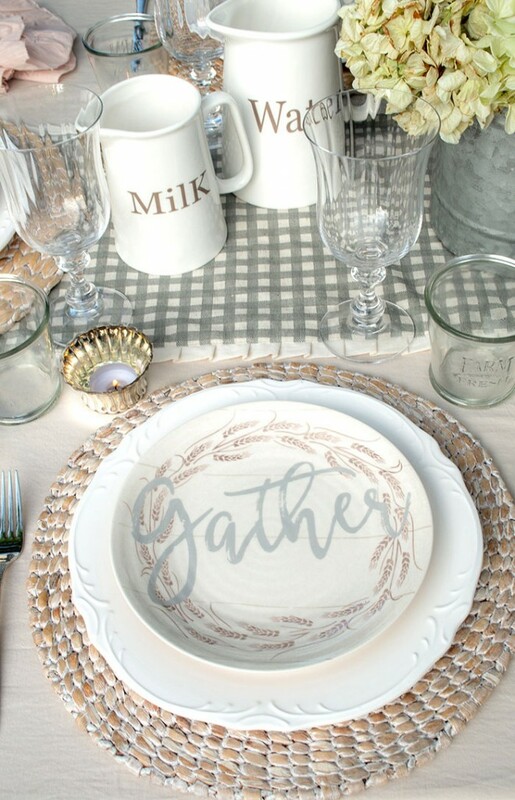 My seasonal item for this table was a salad plate with the word gather across its center and gracefully decorated with a lovely wheat motive around the perimeter of the plate. A simple addition that contributes to the poetic composition of soft colors, beauty and rustic elegance of this table. Ironstone might look delicate, but these hearty pieces of history are made to be used and enjoyed! Ironstone pitchers are a fun and interesting way to add height, shape and a country feel to your table. Plus you can use them to serve water, wine, or any cold beverage that you want to serve. Selecting these components is enjoyable and a great way to display your collections. Hydrangeas are a among our favorite of fall flowers. These blooms are full and easy to style, even when they’re dried. Autumn offers some of the prettiest lush flowers and rich tones. But in early fall, hydrangeas are at their finest. I often cut a few from our garden for drying and preserve. They are as love as any you can purchase. They are beautiful, unfussy and perfectly pleasing. Take a cue from nature and, fill your favorite vase with a bunch of delicate petaled and soft tones hydrangeas, ranunculus, roses or branches. Pull up a chair for friends and family to enjoy a memorable fall meal! Part of setting a table is the enjoyment that I get from the entire process. From selecting the occasion, inviting guests, planning my theme, selecting a menu, choosing my linens, dinnerware, flowers. You get it! But beyond that, entertaining is about enjoying your guests and creating new memories. Your family and friends will love you just for making the effort, so don’t fuss over the details – Relax and enjoy the moment.